Wig Nelson has a new book, String Theory and the Transparent Patient. It is about a particle physicist, Jerome Cleveland, who makes an accidental breakthrough at the Hadron Collider in Switzerland and suffers a traffic accident in N.Y.C. The accident leads to him becoming unstuck to the strings of his universe brane. He finds himself disappearing uncontrollably from time to time until his fellow accident victim, who is also his analyst, Dr. Jerry Hamm, comes out of a coma. Dr. Hamm is charged with curing Jerome's malady one step ahead of the National Security agent who is determined to prove his occupation as an invisible assassin. 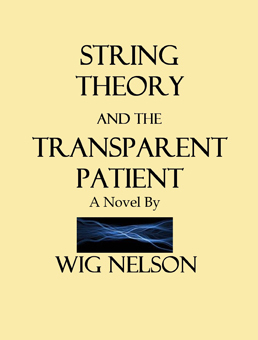 A sequel to String Theory is in the works. It is called The Eccentric Heiress. Wig Nelson's books are available at Amazon and also through his website wignelson.com (discounted 30% with free shipping). Also all his books are available through the Brevard County Library system.